Gourmet-gift expert Shari Fitzpatrick (Shari's Berries) shows how to achieve gourmet chocolate-dipped treats at home for much less than retail price. Dip strawberries in both white and dark chocolate to create a tuxedo effect. Dip in white first, let the chocolate dry, then dip twice in dark chocolate, giving them that little shake to keep a straight line. Buttons and a bow tie can easily be added with the tip of a wooden skewer or piped on using a paper cone. 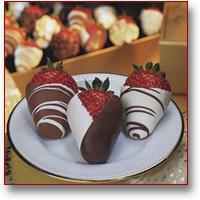 The Original Gourmet Chocolate Dipped Strawberry! 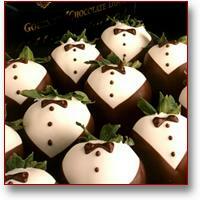 Tuxedo Strawberries, Strawberry Roses and much more chocolate covered strawberry delights. Order Now!